"I'm very shocked because I heard his sudden death. I still cannot believe it. he is sleeping with a very beautiful face. I tried to wake him up again and again, though he is still sleeping. hide was the calmest person in X Japan. it was also hide who always calmed me down and gave advice to me, who was an overimpulsive leader. of course, sometimes he lost his way when he was under pressure. however, he always called me in such a case. we talked about everything; such as our band, music, friends, life, fans. sometimes, he was like my elder brother, and sometimes like a younger brother. sometimes, we drank and fought, but he always said the next day, "yoshiki, what did I do yesterday? sorry, I don't remember anything." however, he went to sleep without saying anyting now. all his fans, and all his friends, everyone is confused I think. I cannot express how sad I am, but we have to accept the fact because we cannot change anything. now, everyone, including his parents, is trying to get over this tragedy. we, X-JAPAN, are also tring to do so. so, all his fans please alo do so. please see off hide, who always encoruraged and supported us, in wonderful way by our hand. please see him off to the heaven warmly." more than 12,000 fans has visited the funeral held at the honganji temple in tokyo's tsukiji destrict on 98.5.7. police arranged helicopers, boats and more than 100 officers to the temple. moreover, 170 private security guards were hired to keep things in order. the line of fans stretched down the street for about a kilometer from the temple gates. some of the fans felt sick after being crushed by the crowd, and some collapsed due to emotional sadness. there were 4 attempted suicides due to hide's death, in which 2 girls died. on the funeral, toshi and yoshiki performed "Forever Love". 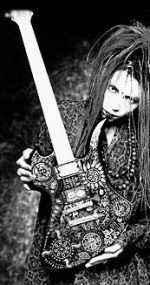 beside the X-Japan members, many musicians attended, including LUNA SEA, GLAY, SHAZNA and tetsuya komuro. FU FU ever free.... in your sight."